If you think you are having a heart attack, do not delay! Dial 911 to get emergency help. The signs and symptoms of a heart attack may vary from person to person. 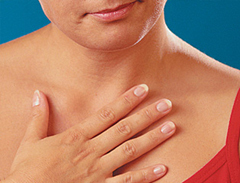 Again, these signs can vary by person and are not limited to the "classic" symptoms of chest pain. 1. Are you having discomfort in the middle of your chest? 2. Are you having any of the following chest discomfort symptoms: Fullness within the chest, burning within the chest, aching within the chest, tightness within the chest or similar type symptom? 3. Do these chest discomfort symptoms come and go? 4. Are these chest discomfort symptoms worse with activity and disappear when you rest? 5. Are you reluctant to tell someone of these symptoms? 6. Are you reluctant to call because you think your mild symptoms do not warrant doing so? 7. Do you have any of these other associated symptoms: Discomfort that goes from the chest to your left arm or to your jaw, clammy perspiration, shortness of breath, nausea or dizziness? 8. If you carry with you nitroglycerin, does the nitroglycerin seem to take away the discomfort within 5 minutes? If you answered yes to most of these questions you owe it to yourself to get these symptoms checked out immediately at the nearest hospital's Emergency Room or Chest Pain Center. It is better to be safe than sorry. Mercy Iowa City is the only accredited Chest Pain Center in Johnson County. We provide state-of-the-art care during the critical window of time when heart muscle can be preserved. Seconds count and we can treat you fast.